When and why did you start farming? ’ve been farming my while life. But the adventure in Idaho farming began nine years ago when we moved to the Fairfield area. We thought farming would basically be the same as back east. WOW….did we have a learning curve. We had a lot of failed attempts at crops in the first two years, learning what we can and can’t grow. But once we caught on to things, we’ve grown by leaps and bounds. What’s your favorite thing about being a farmer? You strive to live off your land sustainably. How so? Nine years ago, our land was a hard-packed gravelly prairie field. Tilling the land to grow anything was a challenge. So we introduced chickens and rabbits and cultivated them for composting manure (eggs were an added plus! ), and hauled in well-seasoned manure from local neighbors. From one year to the next, we so excited to see the growth in the earthworm population. Watering became learned methods of drip lines under straw so no water was lost. Play host to environmentally friendly insects, birds, bats and spiders to help in pest control and good old fashioned hand weeding. What sustainable growing methods do you employ? I don’t use any herbicides or pesticides on the property so I never have to worry about what my chickens or us are eating. We compost a lot of manure into our gardening beds. Watering is done by drip line so there is very little waste. How are you teaming up with co-ops to supply clean, organically grown foods to local buyers? We teamed up with Kraay’s Market & Garden when they were just starting out. We had no idea there would be such a demand for naturally grown items using organic methods, we just knew it was important to us. What have been some of your biggest challenges as a farmer? Biggest successes? Challenges are definitely the wind and water…too much of one and not enough of the other. Successes – knowing someone appreciates what I do as much as I do. Knowing someone is enjoying the fruits of my labor and chose my product as a healthier alternative. Do you have a farming/agricultural hero? Why do you admire them? I admire all the small farmers that work a full-time job and come home and work the second full time job: farming. I admire the small farmers that set up at markets and try to educate customers when told their produce is too high and the grocery store is cheaper. Farmers are one of the few that work the front lines educating the public and still have your back by growing food to nourish you. Why is it important to support local and regional agriculture? It’s the small local farmer who cares about what you eat. He could only care about himself and raise just enough to feed his own family but love of farming doesn’t work that way. Farmers don’t work at farming cause they’re making tons of money. They farm because they love the land, are stewards of the land, and care enough to grow and share. What do you want people to know about farming? Farming is hard, tiring work. But it’s a good tired. At the end of the day, there is always a sense of accomplishment. Some of it you can see…like weeding. Some of it is in your heart…like the pride of a beautiful head of garlic, and some is in your mouth…nothing in the stores taste as sweet as something you grew yourself. The dependency on chemicals that place poisons in the food chain. Encouragement for the small/backyard gardener. Helping them find ways to expand their growing potential and power. 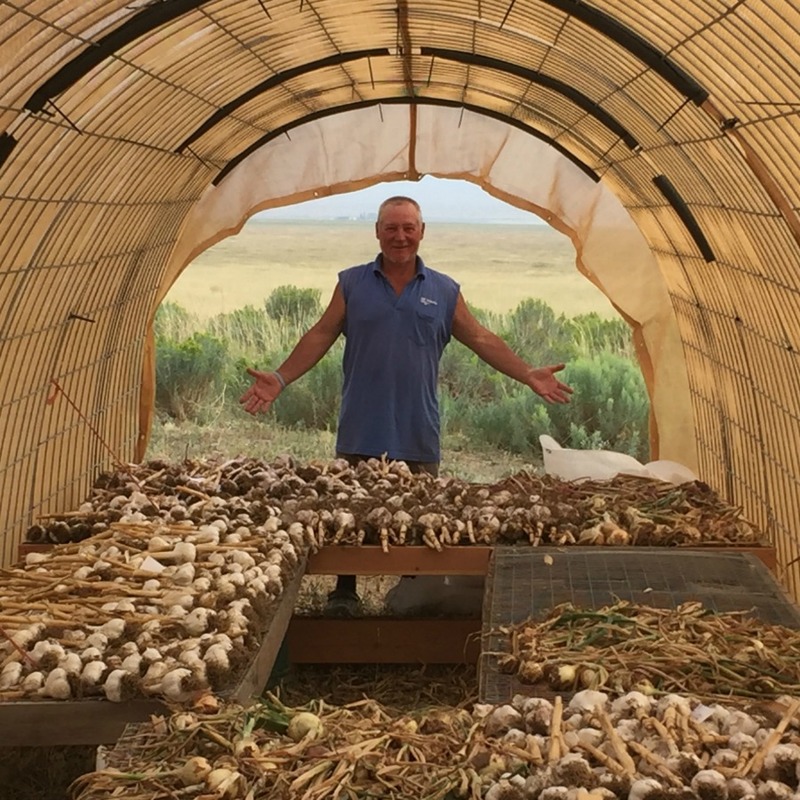 A farmer doesn’t have to have lots of acres to make an impact on the local food system. I believe that, collectively, the backyard/small farmer is one of the largest co-ops that have yet to be tapped within the local food system.